Take a journey through the life, loves and laughter of the world's most beloved Yiddish humorist, as you're treated to an in-depth look at the foolish philosophers, philosophical fools, comical shtetl folk and not-so-comical scoundrels that populated Sholom Aleichem's real and fantasy worlds. This bold and bittersweet, raucous and romantic musical comedy celebrates the great man's 102nd Yahrzeit, journeying through his loves and losses, the controversy surrounding his stories and plays, his fame and his failures. The new musical -- the fifth in the Playhouse Sholom Aleichem quintilogy -- stars veteran performer Chris DeCarlo, who once again takes on the role of the beloved author. 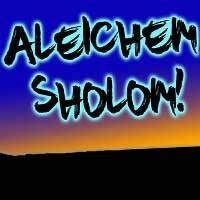 Catch Aleichem Sholom! at The Other Space at Santa Monica Playhouse.